This War of Mine: The Board Game is a cooperative game about surviving in a war-ravaged city for 1-6 players by the well know designers Michał Oracz and Jakub Wiśniewski based on the gripping survival game This War of Mine by 11bit studios In this breathtaking experience players will have to resolve many deeply emotional situations, which are provided by the unique book of scripts – an entirely new way to introduce storytelling and RPG elements into a board game. The brutal realism of This War of Mine: The Board Game is further enhanced by managing the shelter – a ruined building where the players are hiding. You will have to craft new, useful things, search through the rabble or even dig into the collapsed cellar. It is completely up to the players, how they will use their resources and what parts of the city they will explore. Will you survive the war? This War of Mine: The Board Game is a game with a strong focus on the narrative and player decisions. The gameplay is divided into in game days, during which players are designing their survivors to various tasks. The food and water supplies are sparse, there’s no basic furniture and the shelter is a collapsed ruin – so players have to choose their actions very carefully. Each encounter offers something new and players’ choices may have a long lasting consequences for the rest of the game. All of the components shown on this site are not a final product and are subject to change. Unlike the other games, This War of Mine: The Board Game explains the rules to the players while they are playing. There is no need to know the rulebook by heart – the rules are introduced with every passing turn. The board is intuitive and all the cards tell the players exactly what they can do and what choices do they have. Moreover, there is a book of scripts, which hold hundreds of narrative excerpts, describing the characters’ journey. 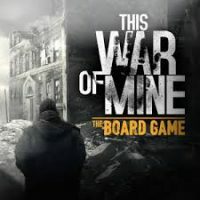 Add a Review for "This War of Mine"